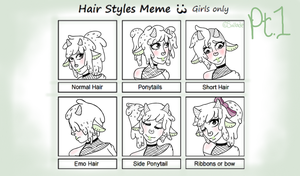 And the "Hair Style meme (Males Only)"? Please, can I use it for my character? I think that it would help me in drawing hairstyles Thank you for reading this comment and have a nice day! Hey can I use this for a few of my characters? Thanks! Thank you! and its fine! I only crossed out kimono hairstyle because... the kimono days of Kiki were the dark days. We do not talk about those days. I could have done better, but... then again, this was literally the best I could've done at this ungodly hour. my artists page on fb post? Honestly I would just go for it. This person probably isn't going to respond or actually check to be sure you used a female character. The sad moment when I have a male OC with an extremely long hair and would be perfect for this meme.